This services are provided as-is and without warranty. The purpose is to provide an archive to help support display applications and produce plots within GIS. Please do not use these services in applications that have thousands of simultaneous users! Our servers will melt! May 3, 1999 : Moore Oklahoma F5 Tornado 7:12 PM. 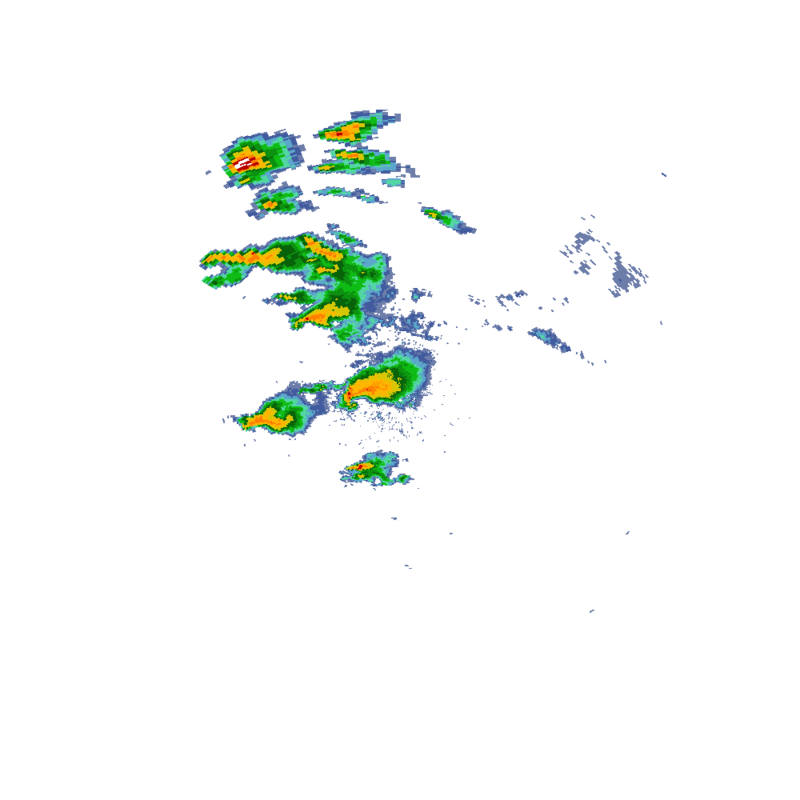 Since 2003, the IEM has been providing composites of National Weather Service RADAR imagery for use within GIS systems. While these composites are nice, they are often ugly at very small scales (due to the crude nature of the compositing process). These images are also of base reflectivity and not of non-compositable products like velocity. The services mentioned on this page provide access to products that contain data from one RADAR site for one level3 product at one volume scan time! The archive for these products starts in 2012, but is being backfilled to cover high end events of the past. This processing is very compute intensive, so backfilling is non trivial. The most recent imagery is dumped into a browser navigable folder here. There is one folder per RADAR site given by its three character call identifier. Data for FAA and DOD RADARs is available as well here. Due to storage and CPU constraints, we are not processing all level3 products at this time. The following is a list of processed products, click on the name for a color ramp for that product. These products are located within each RADAR ID folder as sub-folders. Then inside of the product folder, is the raw imagery. Each image has an associated world file and a json formatted metadata file. This json metadata has information like volume coverage pattern and may contain other information in the future. Data appears in the archive at the same time as it does for the realtime data. So this is neat, but how can you programically work with this data? Here is a example script that uses the API below to download a single RADAR product for a time period of your choice. In order to write fancy pants web applications, you need to be able to find out what imagery exists in the IEM's archive! Here are details on a few JSON emitting web services that may be able to help you. These services are still being developed, so please send critical feedback on how to improve them. This service returns single site and composite RADAR IDs for a location and time of your choice. This attempts to answer the question: if I want to show a map for New York City on 28 March 2011, which RADAR sites are available? If you do not specific a location, the service returns an estimate of RADARs available for the date of your timestamp. This service returns what products are available for this RADAR near a given time. This service returns what volume scan times are available for a given radar, product, and during a period of time. The results of this query can then be fed back to request actual images or tiles from the Tile Map Service. This service has a 500 scan limit return for each query. The 7/33/50 portion is the standard Z/X/Y tile map specification, your plotting application will generate these automatically. The key portion is the "ridge::BMX-N0Q-201201230813" service name. This is used by the server code to find the archived image you want. The "BMX-N0Q-201201230813" should hopefully make sense, it is the combination of RADAR ID, product ID, and UTC timestamp of the imagery! Specifying zero as the timestamp will give you the most recent image, which is hopefully current! There you have it, we would be happy to know what you think of this. Hopefully you come up with interesting things that do not overwhelm our server :) Someday, we will come up with something clever to provide legends for the imagery! All of the generated imagery passes through Unidata's LDM software. If you have LDM and would like a feed of the imagery, we can certainly provide you one! It comes on the EXP feedtype with easy to use product identifiers. A big thanks goes to the National Weather Service RIDGE team, who we have worked with on their RADAR web mapping projects. It is our hope that many of the services developed will find a stable and permanent home with the NWS someday!